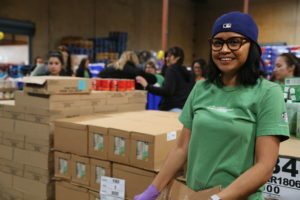 Starbucks Partners also donate time and energy by volunteering at the Los Angeles Regional Food Bank. Starbucks is working with food banks across America, including the Los Angeles Regional Food Bank, to provide nourishing, ready-to-eat meals to people in need. Through an innovative strategic partnership with Feeding America®, Starbucks has set a goal to rescue 100% of unsold food each night from its more than 8,000 U.S. company-operated stores. Working with Feeding America, Starbucks will help provide ready-to-eat, nourishing meals – including breakfast sandwiches, Paninis, Bistro Boxes and salads – to help the millions of people who struggle with hunger in America. True to Starbucks mission to “act with courage, challenge the status quo and find new ways to grow our company and each other,” Starbucks partners (employees) advocated for a program that would allow stores to donate good, unsold food and distribute it to people facing hunger in communities across the U.S. In response to this call for action, working with Feeding America®, Starbucks invested in research and quality assurance testing to develop a program to safely donate nourishing, ready-to-eat meals to the 1 in 8 Americans who struggle with hunger. In Los Angeles County alone, 1.2 million people (and 1 in 4 children) don’t know where they will find their next meal. People who face hunger live in our community — our neighbors, our co-workers and our friends, yet their struggles are often unseen. We fight hunger by working hand-in-hand with partner pantry and meal programs, local school districts, volunteers and civic-minded companies like Starbucks to serve more than 300,000 children, families and seniors in need each month. The food rescued through the FoodShare program goes to feed those who need it most in our community. Programs like FoodShare not only help individuals facing hunger; they affect our entire community and the future of our society. Food insecurity and lack of nutrition have been proven to affect a child’s development and learning. To date, Food Bank has partnered with 369 local Starbucks locations to capture 74,330 pounds of food, the equivalent of 61,9442 meals, for children and families facing hunger in our community. 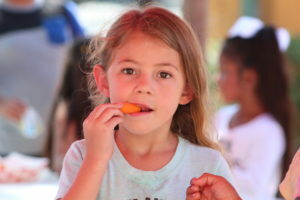 The program is estimated to provide 5,894,775 million pounds of food, or the equivalent of more than 4.9 million meals annually in the LA County.